The Junkyard Essays were born from three things; an admiration for the art of the working man, the nature of storytelling in all its various forms and simple curiosity. The project documents a moment in an individuals life. The essays are elaborated true stories. The 35mm snap shot has been used to capture the remains of a car accident. An accident is a catalyst forcing new directions, new paths. Each photograph has an accompanying story and a license plate number. The project was conceived at JMC Salvage in New Jersey in 1999. "Junkyard Essays" is an ongoing and evolving project which includes performance and educational elements revolving around the art of the tale as much as that of the photograph. 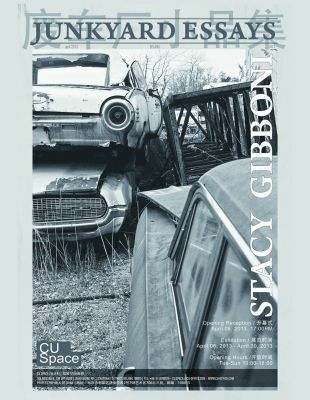 Stacy Gibboni is an American multimedia artist working in Venice, Italy. A graduate of The Savannah College of Art and Design and New York University. Born in Arizona in 1970, Gibboni grew up in South New Jersey. Gibboni has exhibited her work internationally since '89. She has focused her many years in Europe on collaborative projects with other artists focusing on process, relationship, installation, video and dialog. Her work includes concepts stemming from daily life; illegible diaries, woman’s work, documentation of dying "things" and the art of the working man.